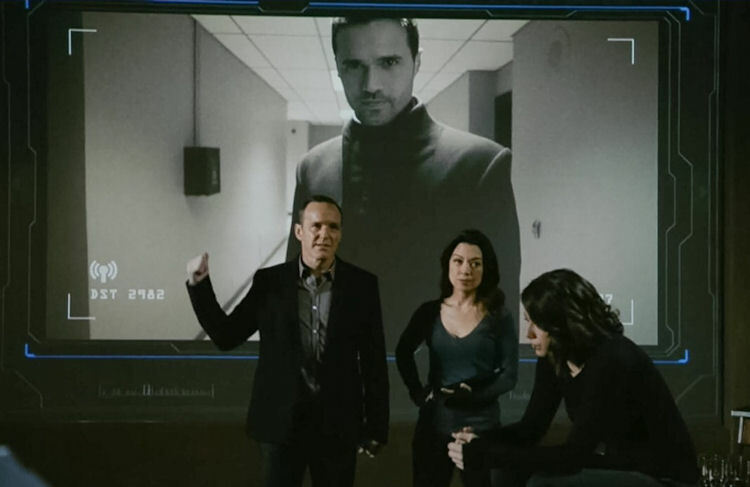 After a recent breakneck pace, SHIELD takes its foot off the gas a little bit to focus on HYDRA’s new leadership dynamic and fill in the backstories of Malick and Lincoln. Hive is throwing a party at Malick’s house and all of HYDRA’s largest wigs are invited. After getting a vision of his own demise last week, Malick isn’t in a partying mood, especially when the entity that he sees kill him is the one throwing the bash. Meanwhile the good guys are scrambling to find a way to take Zombie Ward down. The discovery that Hive is walking around in a Ward suit has thrown the SHIELD team for a loss. Coulson is upset his robot crusher hand didn’t finish the job. FitzSimmons is frantically trying to figure out what Hive is made of and how it relates to research concerning swarming birds that HYDRA tries to destroy. Daisy and Lincoln jet off to South Dakota to talk to an Afterlife washout who frequently ranted about a being from thousands of years ago who sounds a lot like Hive. The rest of the team goes to an agri-chemical plant where they manage to capture the Chairman with the help of some common sense and May’s combat skills. Lincoln and Daisy manage to con the washout out of a Kree artifact he stole from Afterlife before he was kicked out. He also talks about Lincoln’s dark past. Back on the jet, Lincoln fesses up that he was an angry young man who nearly killed an old girlfriend in a drunk driving accident, but he learned to control himself after going to Afterlife. Daisy is immediately forgiving has a confession of her own about seeing the vision of a teammate dying. Meanwhile on the big plane, the Chairman comes to and immediately goes to work escaping. He goes on a rampage once he gets loose and captures the plane and some hostages. Daisy gets a brief distress call from May. Lincoln tells Daisy to screw the dark visions of the future and call up the Secret Warriors to save the day. *No Agent Doug this week, but you totally know he cleaned all the stuff out of that white room so May and the Chairman could stage their boss fight. *There’s so much subtext going on with Simmons during all of this. When she says she can’t believe that thing is here on Earth, she really means she can’t believe she played “hide the tentacle” with it on Bluetooine and wonders if she should get tested for intergalactic STDs. *Ok if the team knows the Chairman can move things within his line of sight, why didn’t they blindfold him and bind his hands? *It looks like Bethany Joy Lenz joins Lucy Lawless and other notables in SHIELD’s “You really brought them in for just that?” club. *Daisy is really getting the hang of her quake powers. What she did to clear the minefield was really cool. *So the main part of the team is in HYDRA’s clutches. So how many of the Secret Warriors are going to die in Daisy’s vision of death in space? This episode was light on action, but fans did get the May vs. Chairman showdown it’s been waiting for all season, so that was worth the price of admission alone. However, Lincoln’s dark secret wasn’t worth the build-up. The writers were clever to address some backstory to make up for the lack of fireworks. In all, an average episode with the promise of better things next week. Next story Blake Lively Bump Watch: Is Deadpool Baby the Second on Its Way? Agents of S.H.I.E.L.D. Review: Do Androids Dream of Totalitarian States?